If you spin or you've watched somebody do it, you probably think ohhhh, so peaceful. And it is, but there are a lot of steps that - to my mind - make it also so crazypants. 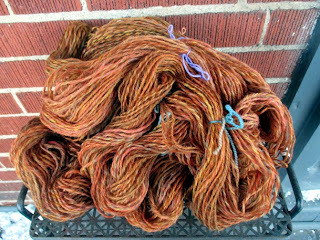 Winding plied handspun into skeins and checking yardages before wet blocking them is one of the crazypantsiest, especially if you've piled up a lot of handspun before breaking down and setting up the gear to do it. Probably there is a better system but at my house, it takes ages. 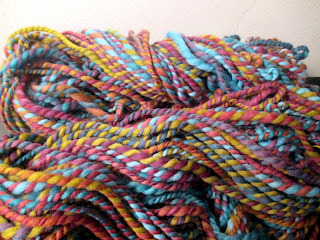 That's Stoddart sock yarn #1, and between it and sock yarn #2 - photographed indoors after sunset - I do in fact have enough to make two pairs of socks. I will have to mix the colours if I start soon, because I wasn't able to keep the weights consistent across just one of them. Alternatively, I may wait to cast on until I have my third bag of fiber spun, in case I have to blend all three colours to make the socks work. 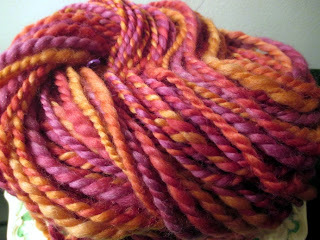 Still: viable sock yarn! I'm so happy to be in a position to meet last summer's dream goal, at last. In case somebody is wondering how I go about prep the yarns at this point, there are several steps, including the noting down of weight, yardage, and the colour of ties I used to secure the four sides of each skein. That last part is so important, because otherwise I'd have to weigh and measure the skeins all over again when they're dry, just to be able to stuff a slip of paper with their information into the middle of the wound yarn cake. 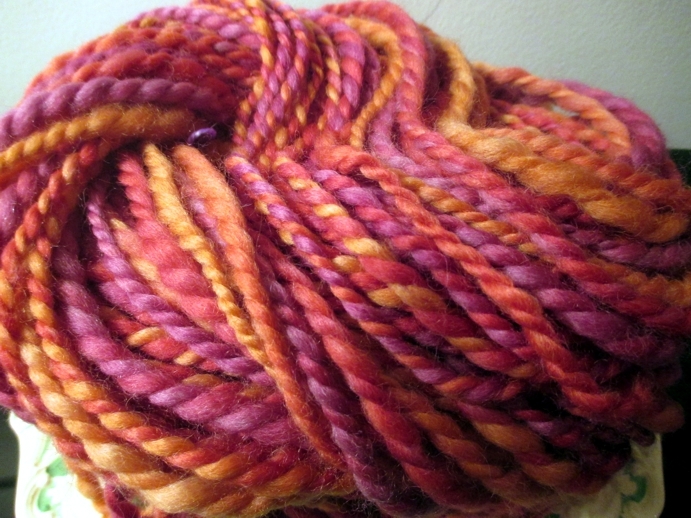 Let's face it: it may be years before I work with some of the yarns I spin. 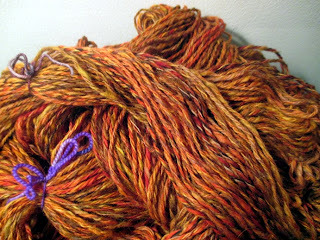 And now, back to yarn. The Lakeside yarn is a bit off kilter, with half of it enough heavier than the other to really mess with my knitting gauge. I still want to make some fingerless gloves but they'll probably have to be for small friends because the only solution is one pair out of each 50g ball. Maybe that would be a nice Valentine... there's time for that, right? 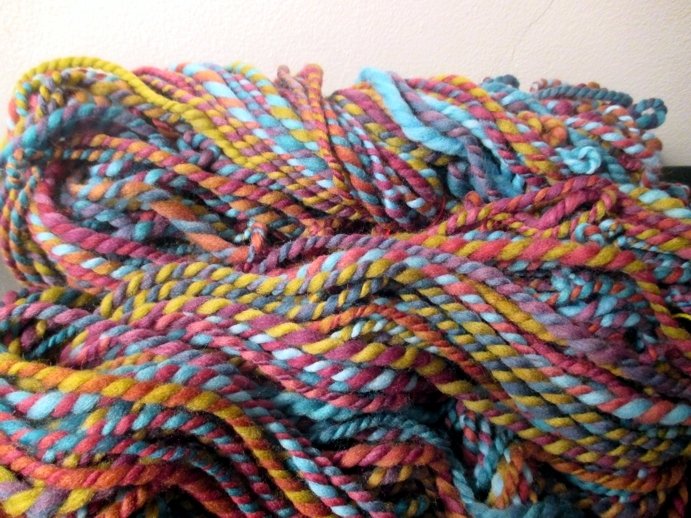 My bulky Twisted Fiber Art experiments came out great by comparison, with the weight pretty consistent across all the individual braids. 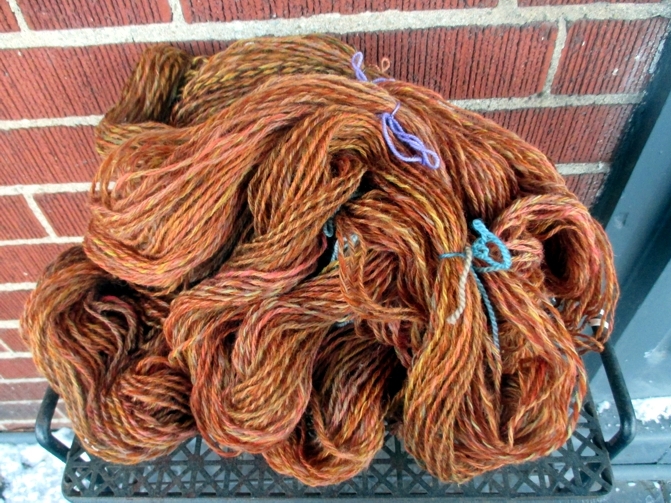 Juliet, which is hopelessly overspun, grew slightly with each of its three skeins. I'll work them in order for a cowl that's a little wider at one end. 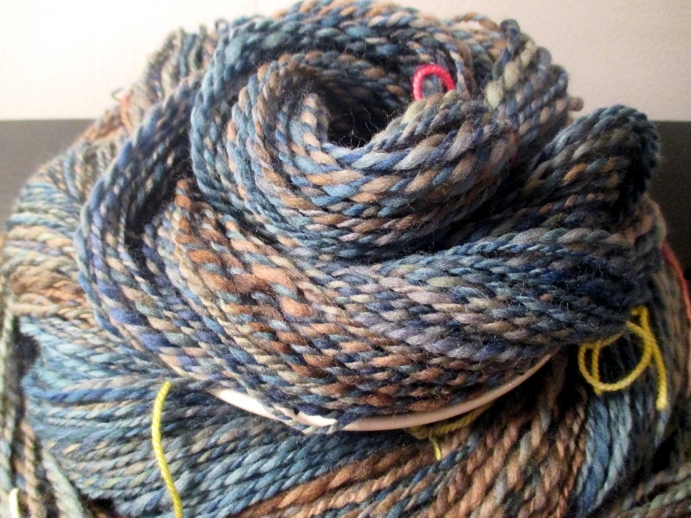 Both skeins of Hijinx are almost exactly the same yardage to grammage, and a little slimmer than Posies - I could do handwarmers if I wanted, but I think a cowl is still the most appealing idea I have here. 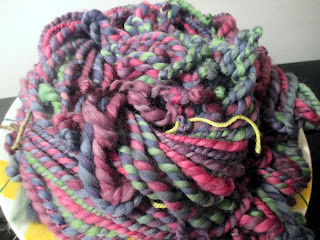 All of it has had its bath now, and a long time drying, and - oh crumbs, then I have to wind it all back into cakes. A spinner's work: never done!